Visual, or optical blending is a technique for blending pre-dyed fibres to create the optical illusion of another colour. With this technique you can create a large palette of colours without having to dye anything yourself. 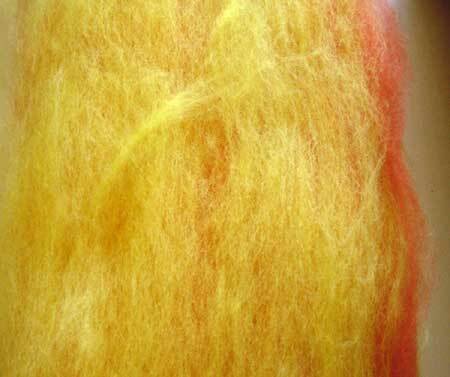 This technique is also useful for “tweaking” any dye-jobs that have not turned out the way you intended as it lets you lighten, darken, or completely change the colour you start out with. 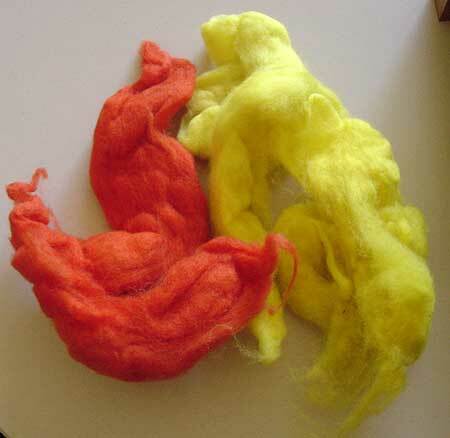 To create a visually blended batt you will need to begin with two or more colours that you want to “mix” together. I wanted a medium orange yarn so I chose to mix dark orange and yellow in order to lighten my orange fibre without making it pastel. (To make a pastel orange I would have blended orange with white instead of yellow). 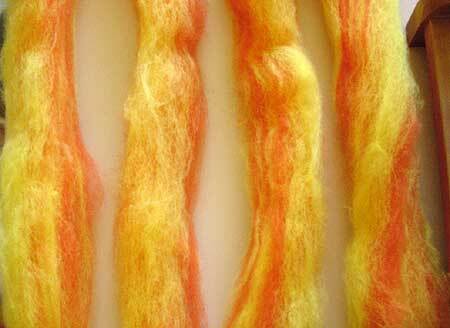 I’m carding a total of 25gms of merino, which will make one batt on my Ashford drum carder. 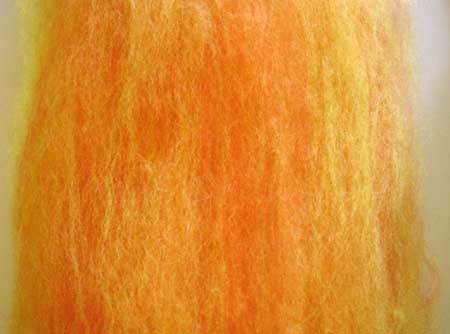 If your fibre will not fit in one batt then weigh each colour to make sure that each batt is made up of the same amount of each colour. 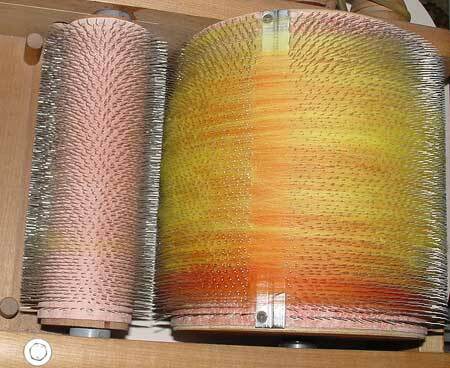 My scrap fibres were quite compressed so I began by carding the colours separately. 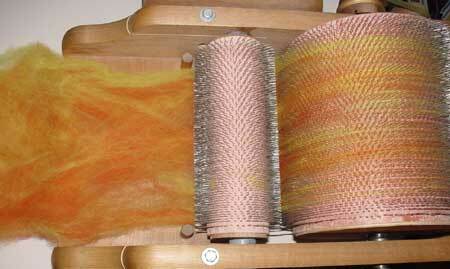 If you begin with well prepared roving or batts you won’t need to do this step. 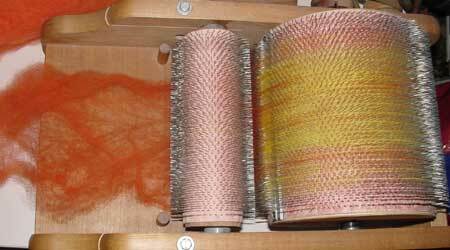 Feed your colours onto the carder in thin layers. and repeat the colours until you have carded all of your fibre. The picture on the left shows how my batt looked after this first carding. Break your batt into 4-6 strips lengthwise. Take one strip and stretch it widthwise so that the colours begin to blend as they are carded. Repeat with the rest of the strips. This is my batt after the second carding. 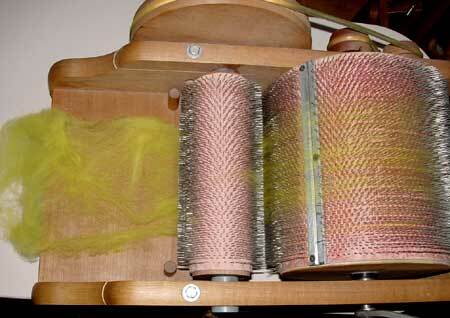 Break the batt into lengthwise strips again and repeat the process as many times as it takes to blend your colours. The colours are blended as much as necessary when you decide they are. Here is the finished batt after being carded a total of four times. 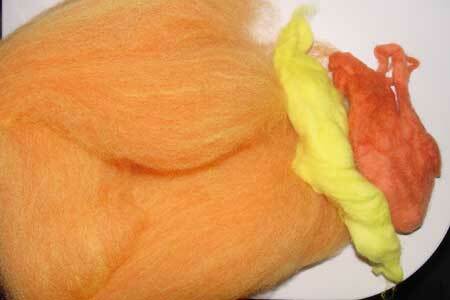 You can see that the orange is much lighter than the original fibre. If you look very closely at your batt you will be able to see the tiny fibres are the same color that you started with, but as you move away from them your eyes are tricked into blending the colours together, making the illusion of a new colour. If you have made a number of batts and they don’t look exactly the same colour you can break them into lengthwise pieces again and blend pieces of the different batts together to even out the colour. You will need to weigh each piece to make sure that you’re using the same amount from each batt. This sounds a bit fussy but it will save you a lot of carding time. 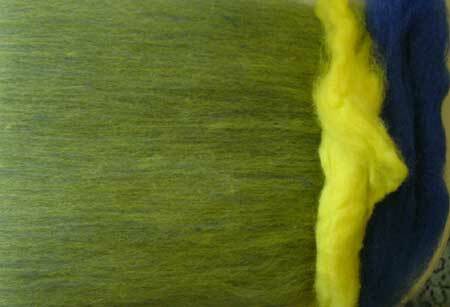 Here, the same yellow wool from the previous example is blended with blue to create green. 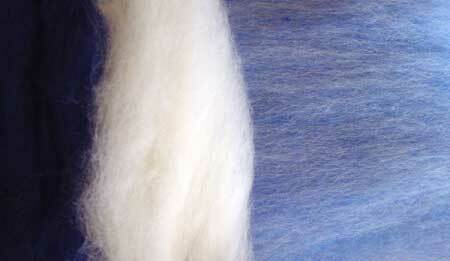 The same blue wool blended with white to make a lighter blue. Copyright Sarah Bradberry September 17th 2008. All rights reserved.